Compiled TFS 1.3 following this tutorial when I tried starting the server it crashed immediately. Have you added your MySQL info to config.lua? There was any errors during compiling process? -- NOTE: valid values for worldType are: "pvp", "no-pvp" and "pvp-enforced"
motd = "Welcome to The Forgotten Server!" -- no skill/experience loss, set it to 0. -- may cause high CPU usage with many players and potentially affect performance! -- priority, valid values are: "normal", "above-normal", "high"
I mean like you installed your Xampp or Uniserv and added the correct MySQL user/MySQL pass in config.lua? because that can cause forgotten server to close immediately when you start it without any errors. Great, Can you try the latest compiled versions through here Pre-Compiled and see if same issue happens? Download Here it is made by one of OTLand's administrator, just download the dlls/.exe and check if it works. Did not see any errors using CMD. If the compiled ones didn't work either so I think it isn't related to compiling or TFS at all as much as I know. You have any antivirus that might be blocking it for some reasons? What client are you using/Datapack are you using? Using the original datapack which is currently 10.98. btw there's no antivirus and I've allowed it in firewall settings. So you don't have any issue in Lua/Datapack/TFS I think so, I believe the issue can be related to your PC/windows might be something blocks it because the compiled versions works 100% and the main datapack also is alright. 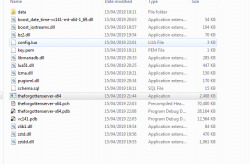 Can you remove all your DLLs and download them through the link I gave above? are you using 32-bit or 64-bit windows? I have already tested with the DLLs you referred to. 1. Have you checked so your ports are open properly? 2. Reinstall your database etc.